Obvious sign of aggression. Intervene BEFORE it gets this intense. One of the most concerning phone calls that I handle with potential clients is the dog owner that is in denial about her dog’s aggressive behavior. Even subtle signs of stress, fear, anxiety, or guarding are big fat red flags indicating that a bite may likely be in the future. I’m sensitive to the fact that dog owners have a hard time wrapping their heads around the thought that their dog could be capable of biting. The fact is that any dog with teeth is capable of biting. 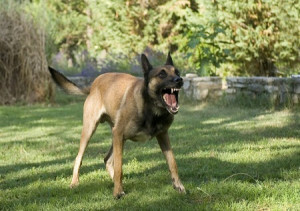 Occasionally I’ll get that call where the dog owner minimizes clear signals from the dog that a bite could be coming if things don’t change. When I explain that the signals are significant and need to be taken seriously, the owner will tell me, “but my dog has never bitten anyone”. The situation is really that the dog hasn’t bitten anyone YET. If the issue is not addressed by a qualified behavior consultant/trainer, a future bite is likely. Working a behavior modification protocol with a potential biter can be dangerous if safety precautions are not taken. It is super important for my clients to take signs of aggression seriously so they can keep everyone safe around the dog always. Often fear and aggression appear together. The assistance of a qualified dog behavior consultant should be enlisted immediately when the signals listed below appear. Please note that these behaviors should be considered situationally. For example, a dog just randomly licking his lips may not be a sign of stress or fear. A dog that exhibits lip licking and a hard stare when being approached by a stranger could very well indicate that your dog is uncomfortable with the situation. Consult a qualified dog behavior expert. The best way to address aggression is to PREVENT it. Work with a trainer from the first day (or first week) your dog or puppy arrived in your home. A qualified dog trainer can help you safely socialize your puppy or young dog safely and demonstrate resource guarding prevention exercises. Please see my blog on dog bite prevention for more details on preventing bites. Looking for a top notch dog trainer/behavior expert in Greater Fort Lauderdale? Please call Oh Behave Dog Training at 954-587-2711 now for a free phone consultation.